Friendly Soldiers adjacent to this unit have a medium range of 2–6 hexes. Q: Does this SA negate the Limited Range 2 special ability of units like the PPSh-41 SMG? A: Limited Range 2 doesn't reduce the unit's medium range to 2 hexes. 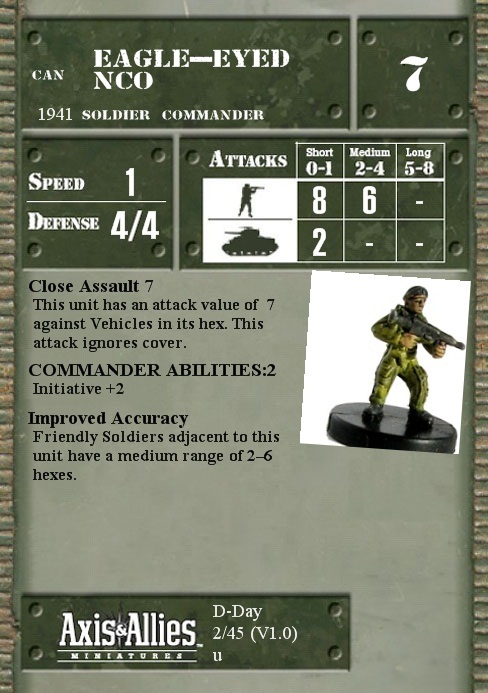 It states, "This unit can attack Soldiers only at ranges of 2 or less." So the Eagle-Eyed NCO extends the PPSh-41's medium range to 6 hexes, but the PPSh-41 still can't attack anything further than two hexes away. Other units that are allowed to use their full medium range can take advantage of Improved Accuracy.